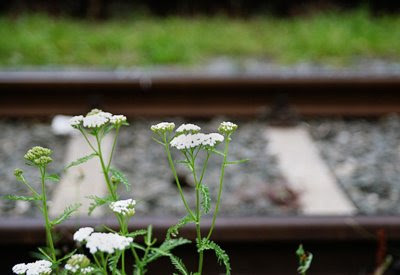 THE PLANT WITH WHITE FLOWER BESIDE RAIL LINE IS OF PARTHENIUM AND THAT WAS A GIFT FROM USA TO INDIA WITH WHEAT. NOW YOU CAN SEE IT ANYWHERE IN INDIA EVEN AT HIMALAYA. THAT PLANT IS CAUSING SERIOUS HEALTH HAZARDS FOR DAILY RAILWAY TRAVELLERS. BUT NOBODY IS BOTHERED.